How to deal with lower back pain? Which ergonomic chair would be the best for you? We have a few tricks and advices! Some studies show that over 80% of people over the age of 18 occasionally experience back pain. So how to choose the best ergonomic office chair? Why so many people suffer from backache? But most important, how to deal with it? In this article you will find answers on all of these questions. You’ll find out tricks for vanish back pain, 5 features of every, good ergonomic chair and 3 examples of this kind of chairs. Both budget, middle-price and expensive one. Why Do We Have So Many Problems With Back Pain? Most of us spend many hours per day in sitting position. For many people it’s one of their favorite positions as it is comfortable and we can stay in it for long hours without much effort. Unfortunately this comfy position may have negative impact on the spine, especially on lumbar vertebrae, which you may already know from your own experience, since you’re looking for the best ergonomic office chair for lower back pain. Which one would be best choice? More on this in a moment. We all like to live comfortably. 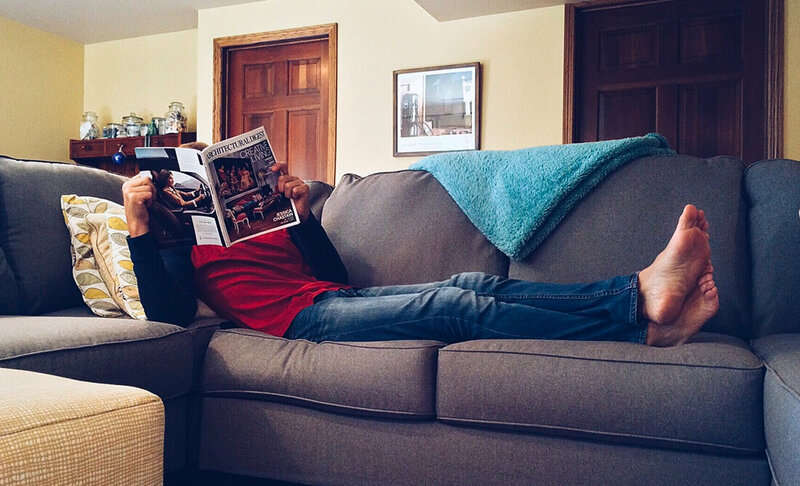 If you’d have to choose between soft, comfy couch and stiff chair, you would probably go for the first one. I would do that too. Nowadays people prefer more comfortable lifestyle. That’s the reason of many diseases, including lower back pain. Instead of using the public transportation we often prefer comfy car even if we spend more time in traffic. We don’t like to spend much time standing and after few minutes we become impatient and start to look for a place to sit even for a minute. However, sitting for many hours is not so good either. After 2 or 3 hours of sitting at the desk we start to feel some discomfort in back and need to take a break. So we stand up to go for a coffee but it takes a while until our back feels normally again. Some people can’t even straighten their back after they stand up. What causes the back pain? Does the sitting position REALLY have such a huge negative influence on the spine? Sitting in proper, health position is not easy and forces our body to hard work. Without proper back and arm support it’s actually impossible to maintain health position for longer period of time. Keep reading to find out how to choose the best ergonomic chair that will support your body during long hours at the desk. Sitting in correct position causes constant tension of spinal erectors – muscles that straighten and rotate the back. Because of this constant strain these muscles don’t receive enough blood which in turn causes the ischemic pain which we experience as fatigue. And if we sit in incorrect position for many hours there is a huge pressure on our back, shoulders, neck, arms or even hips and knees. It may cause not only the pain and cramps, but also decrease blood circulation. The most important thing – choose proper ergonomic office chair that offers good back support and comfortable position for your pelvis, thighs, knees and arms. It is not an easy task as there are dozens of different models in a wide price range. How to choose the best ergonomic office chair? What features should it have? First of all, you can’t expect that a chair that costs $50 will provide you with proper lumbar support. Of course it doesn’t mean that you have to buy a chair that will cost you an arm and a leg. You don’t have to spend $1000, because there are also good ergonomic office chairs with multiple adjustments even for $200 or $300. The best ergonomic chair has not only adjustable height and recline. The backrest is S-shaped. Curved lower part of the backrest should comfortably fit user’s natural lumbar spine curve. There’s a lot of features which good office chair for lower back pain should has. One of them are adjustable arm rests. It’s really useful when the lumbar support is adjustable, as we all differ in height and have different body type. The best ergonomic chairs offer lumbar support which can be positioned up and down, some models also allow to adjust its firmness and move it closer or further from the user’s back. With so many adjustments you would be able to find the most comfortable position that would fit your lumbar spine perfectly. Of course there are also other features that you shouldn’t forget about. Adjustable armrests, adjustable seat depth and backrest height, additional headrest – these are all important functions that may increase the comfort and help you to maintain proper posture while sitting. Thanks to proper lumbar support and multiple adjustments you will have the ability to find proper position for your whole body: back, hips, thighs, knees, feet, wrists, forearms, shoulders and neck. It will help to reduce the pressure on these parts of the body, improve the blood circulation and relieve the pain – especially in lower back. Keep in mind, that the proper ergonomic position is when you can sit all the way back on the seat while keeping your feet firmly on the floor, knees at 90 degree angle without straining your neck, head and shoulders forward. Lumbar support – The lower part of backrest should be curved, it’s nice when it slides up and down, back and forth and has adjustable firmness. Adjustable seat depth – It will allow user to find proper position for his pelvis, thighs and knees. Thanks to that the base of the spine is well supported and the circulation in legs is not impeded. Adjustable chair height – It allows to adjust the chair to user’s height. Adjustable armrests – They give proper support for user’s arms and help to relieve the stress on shoulders and reduce the wrist fatigue. Headrest – It gives support for neck and head and reduces shoulder strain. 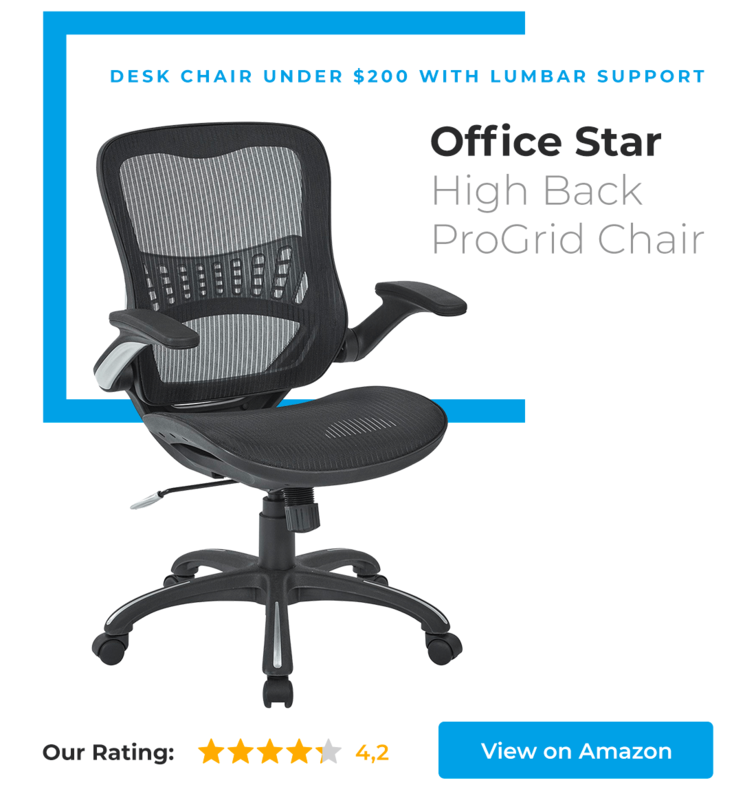 The best budget ergonomic chair for lower back pain is in my opinion Office Star High Back ProGrid Back FreeFlex Seat with Adjustable Arms and Multi-Function and Seat Slider. It has proper backrest shape and can be adjusted in many ways so the user could find his comfort zone and the best support for lower back. 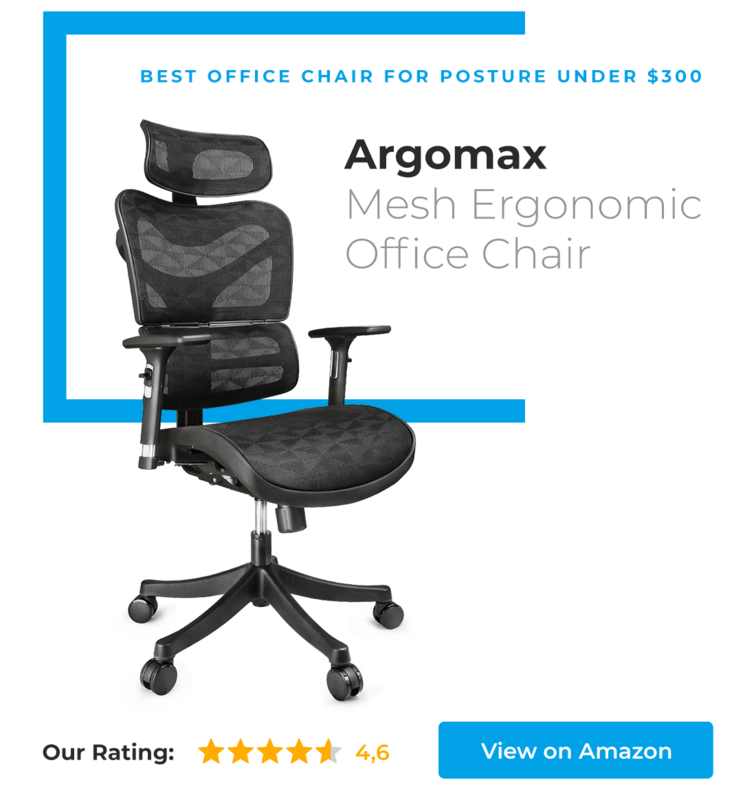 If you have a bit bigger budget you can also consider Argomax Mesh Ergonomic Office Chair – the best ergonomic office chair for lumbar support under $300. It helps the user to maintain good posture and reduced the lower back pain. 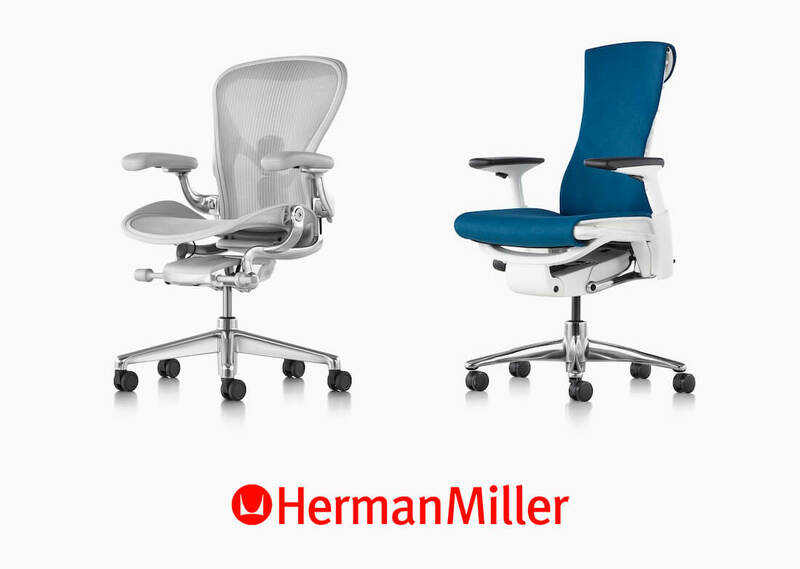 Herman Miller is company with definitely top ergonomic office chairs. For any kind of pain. There are also two high-end ergonomic office chair that are designed to help with lumbar spine pain: Aeron Chair and Embody Chair by Herman Miller. These chairs have modern appearance, lots of adjustments to reduce the stress on lumbar vertebrae, hips, shoulders, neck and arms. If you suffer from lower back pain and have more flexible budget I would recommend going for one of these two chairs by Herman Miller. You can also purchase a lumbar support pillow or roll. You should add it to your office chair and use it while sitting on any other chair (even in the car). Properly chosen lumbar support pillow will adjust to your lower back natural curve and help you to maintain good position that will not strain your spine. There one more important thing: Always remember to take regular breaks from sitting on a chair. Even if you have perfect ergonomic office chair, changing position and taking a break is still very important for your spine condition. PS. If you have limited budget and Herman Miller is too expensive for you, check my article with the best Herman Miller knock-offs. According to some researches there are few ways to make the crippling back pain vanish. Avoid straining your neck and head forward. Your head should be aligned just right above your shoulders. Keep your mouse close, right next to your keyboard, so you don’t twist or strain your shoulder and wrist while clicking. Breathe from your belly to engage your core muscles. Your monitor should be 2-3 inches above your eye level and about arm’s length from your torso. Keep your feet flat on the floor and shoulder-width apart. This will reduce the tension in your knees and ankles. No more crossing your legs – when you sit cross-legged you blood circulation is interrupted. In this position it’s difficult to keep the spine and shoulder straight. Moreover it can cause overstretching the muscles placed around your pelvis. Therefore uncross your legs and keep your knees at 90 degrees right above your ankles. As you can see there are many ways to decrease or even eliminate lower back pain. Good ergonomic office chair is a must-have, but you have to remember about the ergonomic of your work: proper posture, changing position and taking breaks. All of these things will help you to soothe your aching back.